Center, Kyoto Institute of Technology, Kyoto, Japan. Received December 24th, 2010; revised January 4th, 2011; accepted January 11th, 2011. Recycled polyethylene terephthalate (RPET) and recycle polypropylene (RPP) blends filled with a renewable filler, i.e. this could only be achieved when high filler content was present in the RPET/RPP blends. generally found in three distinct crystalline phases i.e. fiber, print ink, paint pigment and cosmetics . that can calculate Ea as a function of sample weight loss. 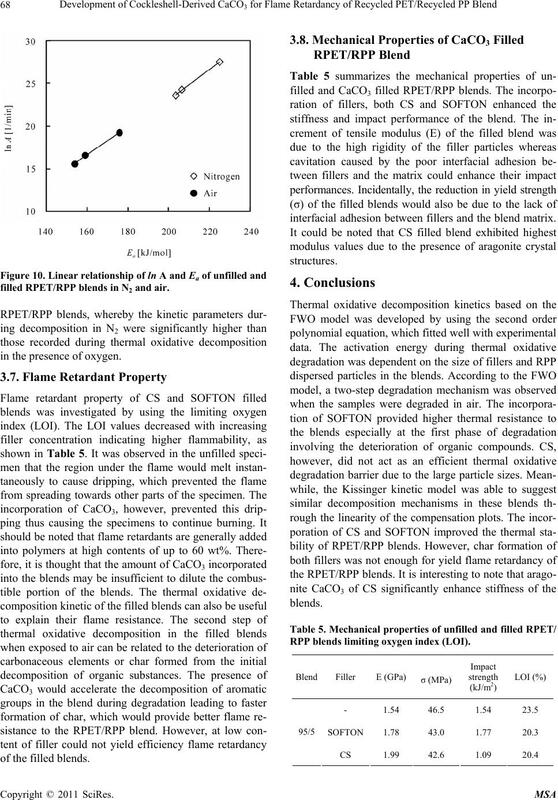 scribing the thermal degradation stability. purchased from Bihoku Funka Kogyo, Co., Ltd., Japan). Commercial grade CaCO3 is hereby known as SOFTON. shell derived-CaCO3 is referred as “CS”. scans were made from 2θ = 5-60˚. mm was determined to be the LOI. ing to ASTM D256 with a pendulum of 5.50 J.
about 25 µm, which was larger than SOFTON. at a heating rate of 20˚C/min under nitrogen atmosphere. cite crystal structure as shown in Figure 1(b) . ing resulting in smaller RPP dispersed phase. stability and Ea by Coats-Redfern equation. its aragonite than calcite CaCO3 structure [4,6]. 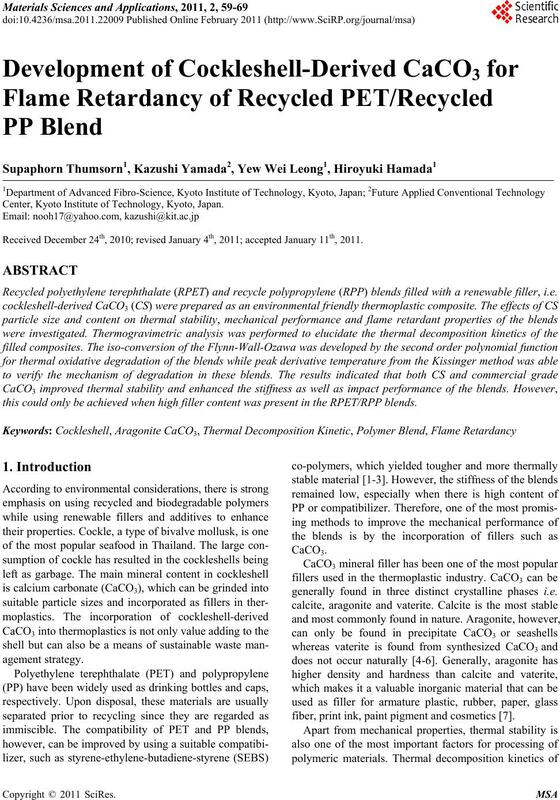 filled and (c) CS filled RPET/RPP blends. thermogram of CS filled RPET/RPP blend in N2. and filled RPET/RPP blends in (a) N2 and (b) Air. dels as reviewed by Khawam et al. .
rate decreased until the decomposition process ended. 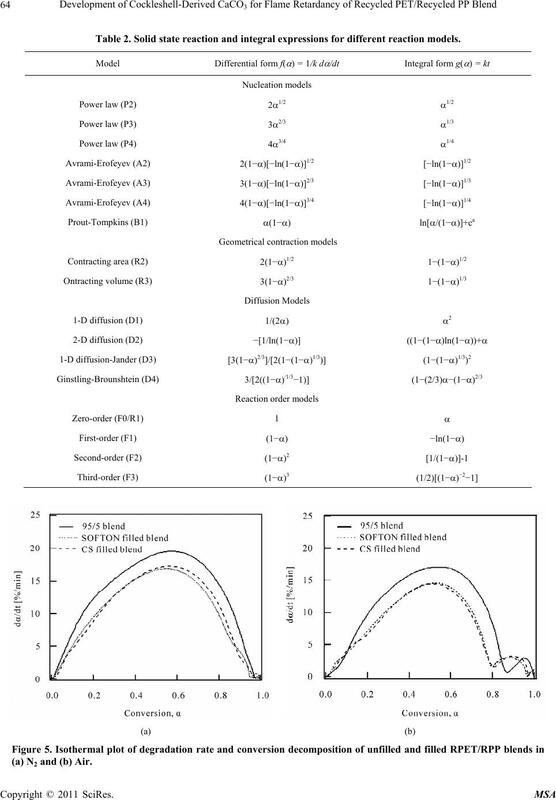 models, which corresponds to reaction-order models . filled RPET/RPP blends during decomposition in N2. ing earlier decomposition profiles shown in Figure 4(a). Table 2. Solid state reaction and integral expressions for different reaction models. (a) N2 and (b) Air. 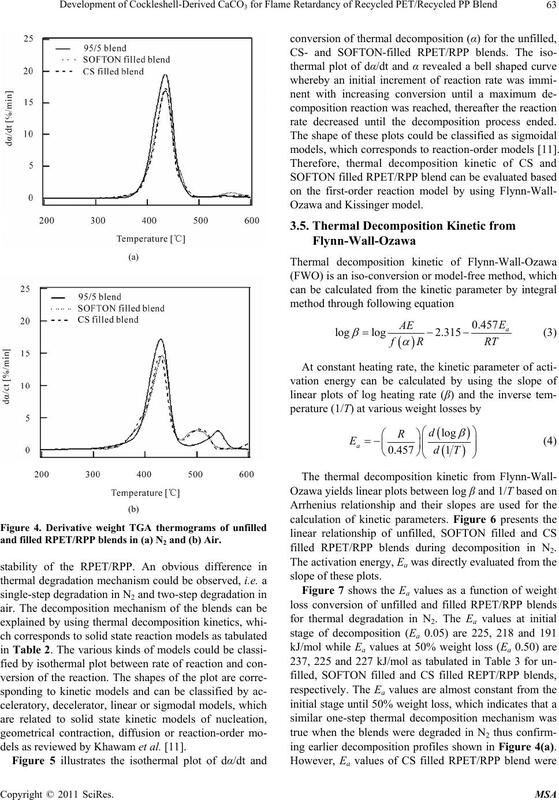 TON filled and (c) CS filled RPET/RPP blends in N2. 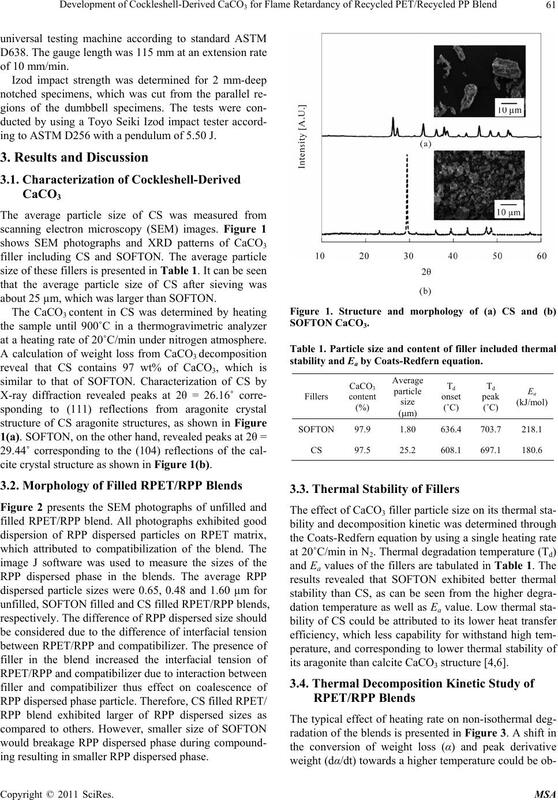 thermal stability of CS than SOFTON. 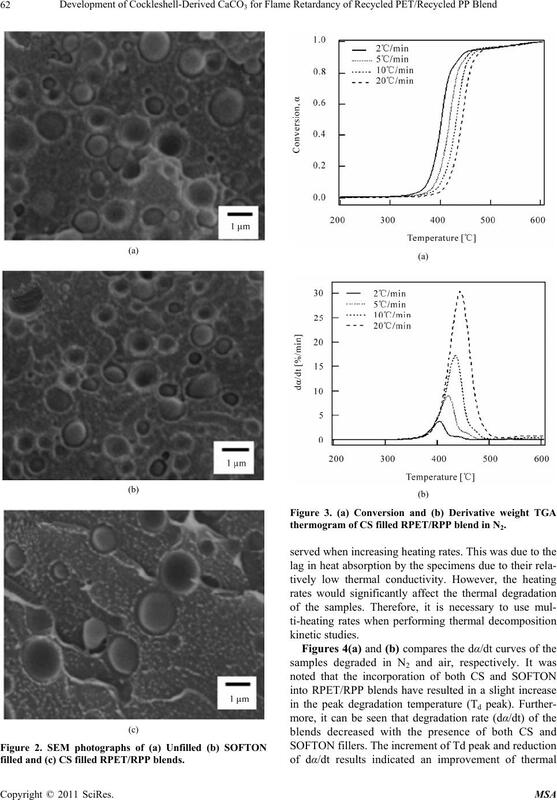 from non-isothermal degradation at various heating rates. TON filled and (c) CS filled RPET/RPP blends in air. radation profile of thermal oxidative degradation in air. 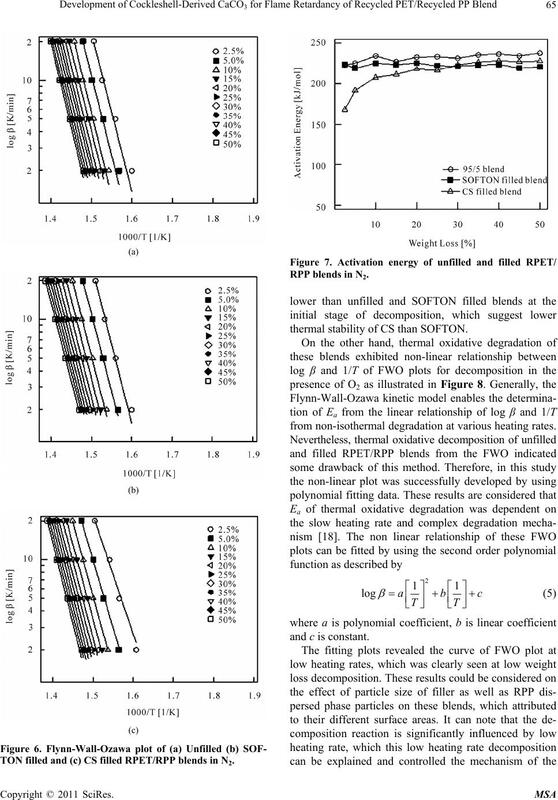 RPP blends from the Fly nn-Wall-Ozawa method. since the latter could become a good oxygen barrier. thermal oxidative degradation in the presence of oxygen. degradation (dα/dt) as compared to the unfilled blends. intercepts of the Kissinger plot. Table 4. 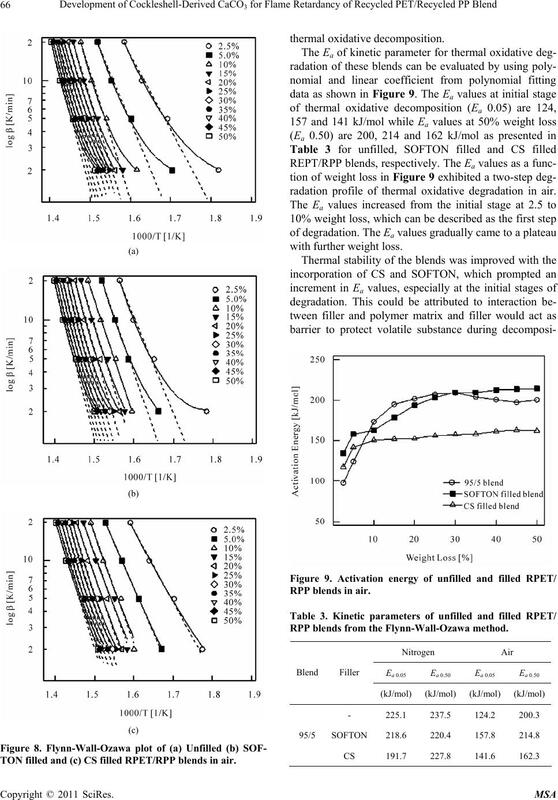 Kinetic parameters of unfilled and filled RPET/RPP blends from the Kissinger method. filled RPET/RPP blends in N2 and air. interfacial adhesion between fillers and the blend matrix. RPP blends limiting oxygen index (LOI). for preparing cockleshell and Dr. Koji Yamada and Dr.
Japan for limiting oxygen index measurement. Vol. 65, No. 2, 1997, pp. 241-249. 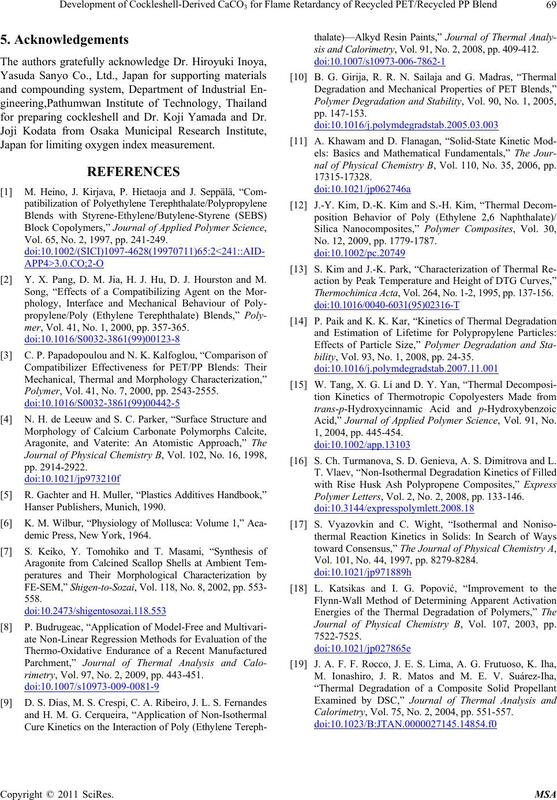 Y. X. Pang, D. M. Jia, H. J. Hu, D. J. Hourston and M.
mer, Vol. 41, No. 1, 2000, pp. 357-365. Polymer, Vol. 41, No. 7, 2000, pp. 2543-2555.
demic Press, New York, 1964.
rimetry, Vol. 97, No. 2, 2009, pp. 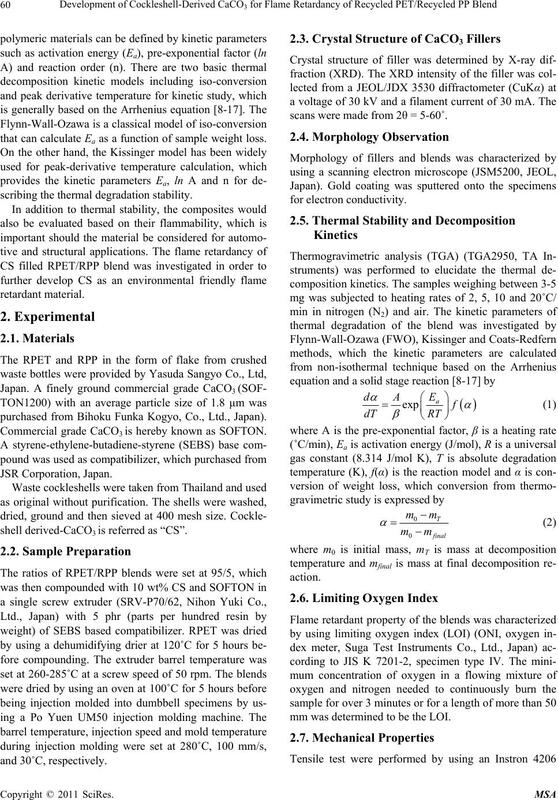 443-451.
sis and Calorimetry, Vol. 91, No. 2, 2008, pp. 409-412.
nal of Physical Chemistry B, Vol. 110, No. 35, 2006, pp. No. 12, 2009, pp. 1779-1787. Thermochimica Acta, Vol. 264, No. 1-2, 1995, pp. 137-156.
bility, Vol. 93, No. 1, 2008, pp. 24-35. Acid,” Journal of Applied Polymer Science, Vol. 91, No. S. Ch. Turmanova, S. D. Genieva, A. S. Dimitrova and L.
Polymer Letters, Vol. 2, No. 2, 2008, pp. 133-146. Vol. 101, No. 44, 1997, pp. 8279-8284. 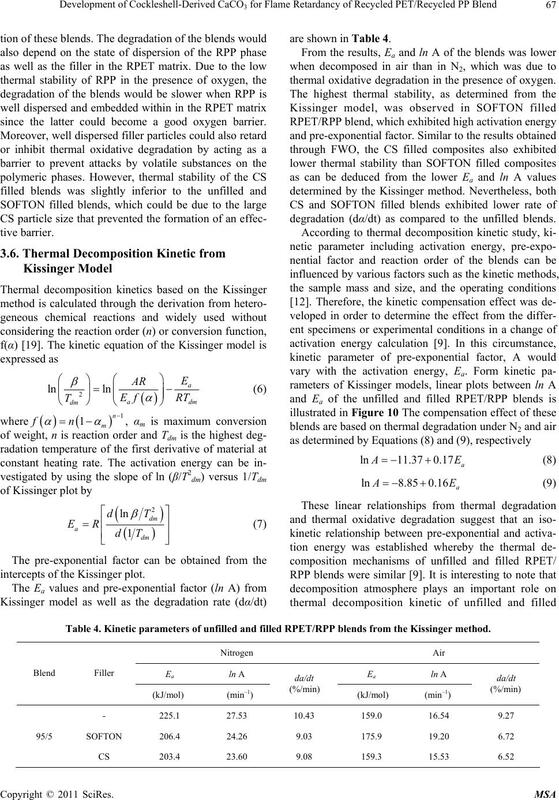 Journal of Physical Chemistry B, Vol. 107, 2003, pp. Calorimetry, Vol. 75, No. 2, 2004, pp. 551-557.